Yes, it's a bonkers amount for a capo, and if you require mega-quick changes, these might not be for you, but if no capo has fully convinced you yet, we suggest you give one a try. Just don't lose it! If you've spent a few quid on a guitar or two, an acoustic amp and perhaps some choice pedals, you probably also trawl the web looking for other tasty knick-knacks to complement your prides and joys. Nice straps, for example, or boutique picks made from premium materials... or what about a 170-quid capo? No, that's not a typo. Yes, apparently, Elliott models don't rob your guitar of its tone - as some other capos can - and instead maintain its natural 'voice' while simply raising the pitch. Elliott capos are all engineered from polished stainless steel, and our Hybrid and Deluxe models feature a 'push to unlock' top bar wrapped in a thin, clear plastic sleeve, with a leather clamp pad to protect the guitar's finish, and a knurled tension adjustment thumbwheel. They are also very slim - especially the Deluxe - so they take up minimal space on your fretboard. We enlist acoustic guru Stuart Ryan's cultured ears and using two 'staple' instruments - Stuart's Gibson J-35 and this reviewer's Martin D-28 - we gather a selection of well-known capos from various brands and set about comparing them with the Elliott models. From full strums to intricate picking, the Elliott Hybrid and Deluxe seem, to our ears at least, clearer and cleaner and - as was promised - there's a definite sense that both of these capos retain each instrument's inherent tone, whether they're sited low or high on the neck. They're not the speediest to change and you can't clip them to your headstock, but they're so slim some players can simply clamp them on the nut (although not our Martin, with its vintage-style volute). 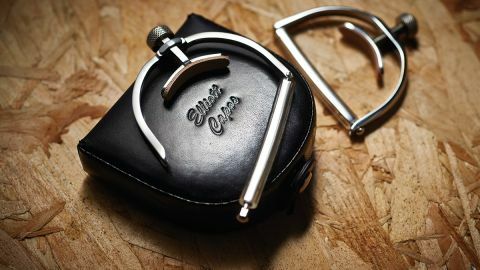 But where we suspect these capos will find greatest favour is in the studio, where their tiny footprint, precise positioning, micro-adjustment and tone friendliness will ensure the best possible recording. Exclusively available from The North American Guitar, 0207 835 5597.